Sometimes we have to take a minute to count our blessings and be thankful. 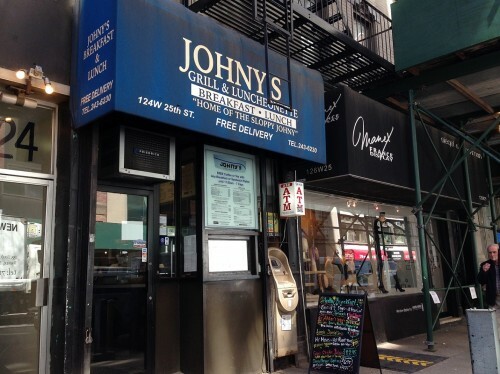 And this week, we are thankful for Johny’s Luncheonette. We are so lucky to have such an inviting and dependable place. Johny’s was featured in FL back in 2010, and recently, a friend of friend who works around the corner was extolling the virtues of Johny’s for everything, especially the omelettes. I loved everything about the atmosphere of this place: the way the cook was masterfully prepping multiple orders at a time on the flat-top (that’s my roast beef and mushrooms going on the flat-top in the photo above), the way Johny greeted regulars, and the way regulars bantered back. It reminded me of the Cheers theme song – Sometimes you want to go, where everyone knows your name, and they’re always glad you came. While the menu could be overwhelming, I read in the comments section of the previous post, and immediately, knew I wanted the Munchie ($7.75) with hot roast beef, sautéed mushrooms, melted mozzarella, onion rings on garlic bread. Um. Yes, please! I went over budget by adding fries for an additional $2.50 to see how much food it would be. Note: this photo is not an accurate reflection of the portions since I managed to eat 1/3 of the fries on the way back to the office. But other than the fries needing a little salt, I think it was wise to do the full meal option. Granted, I only ate half of my Munchie with all the fries for lunch. If you work near Johny’s and you don’t regularly sit at the counter for a quick, filling meal, you are missing out. And if we lose a gem like this, I’m blaming you. Posted by Sarah Zilinski at 9:00 am, April 18th, 2014 under Flatiron Lunch. You need to get the Curious George here. 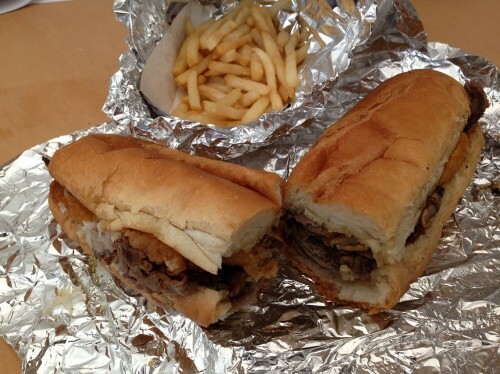 It’s one of my top hangover sandwiches.